Rosewood Naturals Breakfast Cookies are an assortment of 3 different kinds of delicious cookies; dandelion & sunflower, marigold & banana and parsley & raspberry. All of the irresistible, crisp and crunchy cookies included in the assortment are cereal free. These excellent quality treats are 100% natural and help to improve your pet's health and well-being. 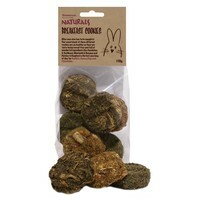 Ideal treats for rabbits, guinea pigs and chinchillas at any time of day. These always keep my house rabbits busy, when I need to put them in their pen for a while. They really like them. My bunnies really loved trying these. They were eaten quite quickly so I will have to buy them some more soon.